Our family is heartbroken that my college sweetheart, husband of 17 years, and daddy to our two beautiful daughters, Jeff Miranda, was diagnosed with ALS (Lou Gehrig’s Disease) in December of 2015 at the age of 42. He went from being an extremely fit cyclist to 100% dependent in 3 years. He lost his ability to speak, eat, walk, and is now basically paralyzed from the neck down. His only way to communicate is by using a computer with eye gaze technology. He eats through a feeding tube, and relies on me for all his needs. 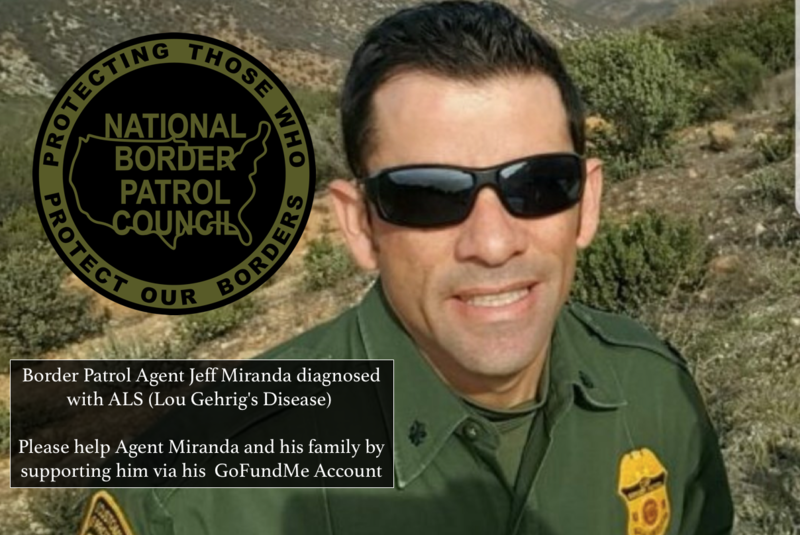 Jeff dedicated 17 years of passion for our country with the U.S Border Patrol and thrived in every position he held. Although ALS has forced Jeff to give up the job that he loves and that supported our family, he still bleeds red, white, and blue! Physically unable to work, Jeff can no longer financially provide for our family to maintain our current and future expenses. I recently had to quit my job to render the around the clock assistance he needs due to this disease. Although ALS has robbed him of so much, he continues to make people laugh, and inspires others to live their lives with a smile just as he does. 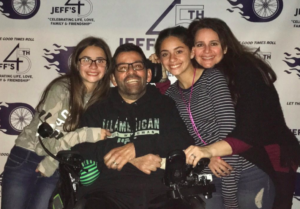 Jeff has always said that the greatest effect that this disease has on him is the emotional and financial burden that this disease has on his loved ones. As this terminal disease progresses, he will soon need a tracheostomy to put a permanent ventilator on so he can continue to breathe. With his mounting medical bills and being forced to retire, Jeff and our family are extremely worried that our enormous financial cut down will cause us to lose our home which has already been modified for his physical needs. We have been very blessed. He has been the most loving husband, the most involved dad, the most loyal, honest friend, hardest worker, and bravest, strongest man I know. He has lost so much, but amazes me daily with his fighting spirit! I would like to relieve him of this extra stress and pay off our house. To uproot our family from our home would be beyond overwhelming for all of us. I am desperately asking for any financial support you can offer in helping me to lift this added burden. Any support will be profoundly appreciated! He has given so much to our family and this country. I pray that I can just give him some peace of mind!